Natural Science Collections provide a valuable resource for helping us to understand the world in which we live. Apart from being hugely popular with the public, natural history collections play a vital role in our understanding of biodiversity, evolution, population genetics and the environmental impacts of climate change, pesticide use and so on. This is because historical collections provide base-line data against which modern observations can be compared and to produce predictive models. The most fundamental role of natural history collections is safeguarding type specimens. These are preserved specimens of the individuals that were used to describe and name a species, providing the basis for taxonomy. Every plant, fungus and animal you see in your garden has a scientific name that comes from such a description and each new proposed species needs to be compared to the preserved types of other similar organisms in order to ensure that it is in fact different to anything already described. Obviously the life in your back garden is quite well known by now, but there are still parts of the Earth that have not been thoroughly investigated and new species are coming to light all the time – particularly in the oceans and tropical forests. Beyond the important type specimens, museums also hold voucher specimens [pdf], which are examples of organisms collected during biological recording and other research. 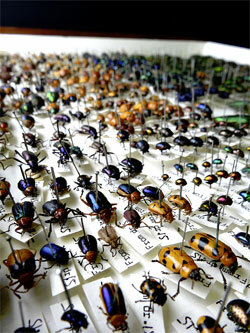 These specimens are physical proof that work has been conducted and that species have been described accurately. Most importantly, they have good information about where and when the specimens were collected. Every natural history specimen with good data provides a physical snapshot of a species or community at a particular point in time and space. It is this physical record that makes museum collections so valuable –- you can’t extract DNA from a photograph and you can’t test a written description for pesticide residues, but a physical specimen can provide a wealth of unexpected information. Specimens collected before DNA was even known are now able to provide information about how populations have changed over time and how that might influence conservation of threatened species. This kind of study is of particular interest where populations have suffered dramatic decline and face genetic bottlenecks, as with several beleaguered bird species from New Zealand [link opens pdf] and tumorous Tasmanian Devil. But it’s not just preserved DNA that can be useful. Much of the research that led to tighter controls on pesticide use in agriculture (including the banning of DDT) came about by comparing the thickness of eggshells in museum collections from the 19th-20th Centuries [pdf review and related research on British Thrush eggs]. For research to be possible, museums need to be able to care for their collections and make the associated information as accessible as possible to researchers. The Internet provides a fantastic medium for access, but unfortunately many museums are struggling to get information onto databases due to the volume of data and lack of staff. The museum sector is undergoing a period of substantial change in which priorities and models of work are being reassessed in light of funding cuts. Social Enterprise has been embraced by some museums [pdf] and may provide some good opportunities, particularly if the development of partnerships can increase collections access. However, change also brings the potential for considerable threats, particularly if focus shifts away from long-term collections care, access and development. An additional danger, particularly for hard-hit regional museums, may be the loss of the specialist staff needed to identify appropriate partners and develop the relationships needed to survive the uncertain times ahead. Nothing will ever replace the taxonomic knowledge and training that museums provide; funding in this area should become a national priority. Otherwise, knowledge of this planet’s biodiversity, and of all the potential benefits therein, will be lost.